Carmelized Onions | And sometimes I cook. 1. In a large skillet, melt butter in the olive oil over med-high heat. 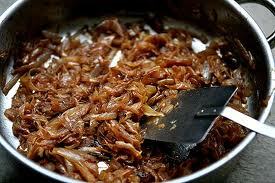 Add the onions and 1/4 tsp each s & p, and cook, stirring constantly, until the onions begin to soften, about 5 minutes. 2. Stir in the sugar and cook, scraping the browned bits off the bottom of the pan frequently, until the onions are golden brown, about 20 minutes. Pingback: Baked Macaroni & Gouda | And sometimes I cook. Pingback: Roasted Garlic & Butternut Squash Soup | And sometimes I cook.